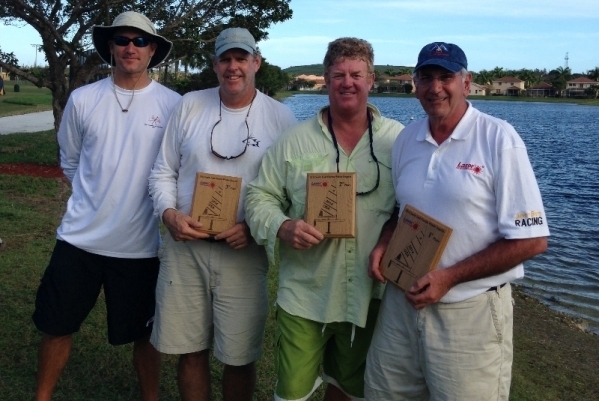 The First Annual SE Florida Regatta was held on Sunday, February 23rd in Coconut Creek, Florida and was a huge success. Barr Batzer and his team produced a wonderful Chamber of Commerce day of RC Laser Racing enjoyed by 27 competitors. The range of skippers was wide and the format for two fleets was created to give new and experience RC Laser skippers a chance to learn the racing skills as well as compete for prize in two fleets. A host of skippers came from new fleets just starting up in Vero Beach, FL. Barr created three seeding races to shape two fleets, A and B. Then the A fleet, competed in four individual races for the top prize. Nick Mortgu, from Riverton, NJ, captured the top price by sailing a consistent series. Nick demonstrated exceptional boat speed and tactics to sail at the top in every race. Myles Loesel, from Pompano Beach, was second. Myles sails out of the local Sabal Pines fleet. Myles was followed by John Luscomb, from Palm Beach Gardens, a top sailor in both big and other RC boats, who borrowed a boat and finished the day in third place. In the B fleet, former RC Laser Class Secretary, Jake Leo, from Port ST. Lucie, FL, shaped a great day to garner the top prize followed by Steve Hopkins and Steve Baine, who was sailing in his first big RC Laser Regatta. Thanks go to Lynne Springer, Myles and Scott Loesel, Ken Batzer, Tony Gonsalves and Clem Grosvenor who gave great support to Regatta and Race Chairman, Barr Batzer. Now it’s on to Punta Gorda next Thursday for the second leg of the 2014 edition of the Snowbird Series.